MexGrocer.com proudly brings you authentic Mexican coffee 100% cafe arabica from Chiapas, Mexico. This flavored coffee, has infused the rich Mexican chocolate taste of cacao nibs, cinnamon and sugar. Its varietal comes from typical coffee plants, which has an excellent cup quality. We have hand picked our beans to bring the perfect aroma and acidity levels that are ideal to the coffee connoisseur. In fact, we're so sure you will love our arabica coffee that we're willing to give a 100% money back guarantee. 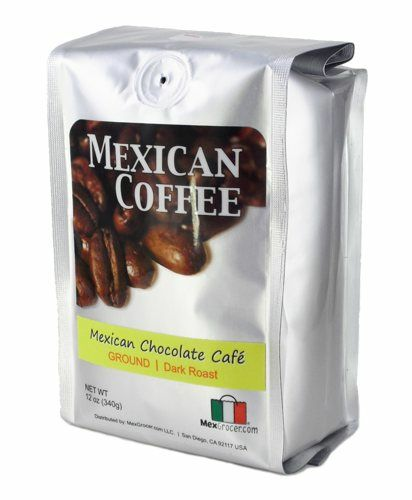 Café con Chocolate de MexGrocer es la combinación de cafe Mexicano de Altura con Chocolate de Mesa y tiene un sabor único que una vez que lo pruebes te gustara tanto que se convertira en tu bebida favorita para relajarte y disfrutar un buen cafe con el toque de chocolate Mexicano. Fine coffee flavor with just the hint of chocolate, not overpowering . Great for starting the day. Do recommend.